How long has it been since you thought about your sump pump? If you have an unfinished basement or crawlspace in your Brooklyn home, do you even know if you have one? A sump pump is a valuable piece of equipment because it keeps rain and floodwaters where they belong: outside your home. But it’s useless if it isn’t working properly or breaks when you need it most. That’s why early spring is the perfect time to get your sump pump inspected and repaired, to consider upgrading the sump pump you have or installing a sump pump if you don’t have one now. If it’s time to have your sump pump inspected or a new one installed, the service experts at Petri Plumbing & Heating can help. A properly installed and maintained sump pump can protect your home and belongings from flood damage, and it can protect your family from dangerous indoor air quality issues like mold and mildew. There are a two types of sump pumps to be aware of: submersible and pedestal. A submersible sump pump is housed in a hole or sump pit in your basement or crawlspace, and a pedestal pump has the motor set above the sump pit. For both types, water from your basement runs into the sump pit through pipes or gravity. When the water reaches a certain height, it trips the pump’s pressure sensor, activating the pump, which moves water along pipes and out of your house, either to your lawn or a municipal sewer system. 1) It’s old. A properly maintained sump pump has a life expectancy of about 10 years, less depending on frequency of use and other factors. 2) It’s noisy. Your sump pump will make noise while running, but unusual or irregular noises like thudding and rattling are signs you need a repair. 3) It runs too much. 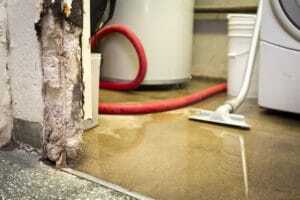 If your sump pump is running too long or too much, you should call for repair as soon as possible. 4) The sump pit is empty. If your sump pump is running with no water in the pit, it might not be installed correctly, or there’s a problem with your drainage system. Consider adding a backup battery to your sump pump. Heavy rain can be accompanied by power outages, and your pump does you no good if it doesn’t have power. Petri Plumbing & Heating’s service experts can recommend and install the right sump pump for your needs, and we can inspect and maintain your existing sump pump. If you want to make sure your pump is ready when spring rains fall, call us at (718) 748-1254 or contact us online today!